Ensure that your family is protected in the event of the unexpected. 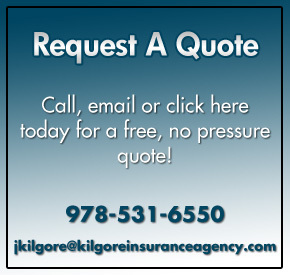 At Kilgore Insurance Agency, we provide you with the best coverage possible. Years of experience allow our professional staff to create a life insurance plan that is customized to your needs and budget. Discover valuable insurance solutions for all your needs, including family protection, a court order because of divorce, mortgage protection, tax benefits etc. Kilgore Insurance provides access to all types of Massachusetts life insurance products. Whether it is a term life policy for a specific need such as family protection or a second to die policy for estate tax protection, let the professionals find the coverage that is right for you. Utilizing a variety of superior insurance companies, our team is able to provide a comprehensive approach for individuals, businesses and families. Make sure your family is protected when the unexpected happens. Call or e-mail Kilgore Insurance at 978-531-6550 or jkilgore@kilgoreinsuranceagency.com to speak with our Life Insurance professionals and find out what best fits your needs.